In the history of aviation transitional periods are always marked by attempts to develop more powerful engines The first turbojets offered only meager thrust. 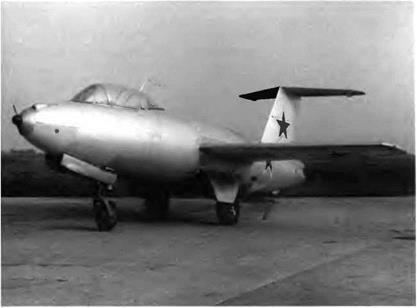 For example, the first Soviet jet—the TR-1, designed and built by A. M Lyulka—delivered power equivalent to 1,323 daN (1,250 kg st) and was not available until 1947. The wartime German jets Jumo 004 and BMW 003 had thrusts limited to 880 and 785 daN (900 and 800 kg st) respectively Therefore, during this transi­tional period several aircraft manufacturers including Mikoyan and Guryevich decided to test the efficiency of rocket engines or ZhRD (Zhidkostniy Raketniy Dvigatyel liquid-propellant rocket engine) for a new type of high-speed, high-altitude interceptor At that time, only the rocket engine could meet those two requirements One of the basic advantages of rocket engines is that their thrust is slightly subordinat­ed to speed and altitude, two values that then depended only on the amount of combustible and oxidizer the interceptor could carry in its tanks. 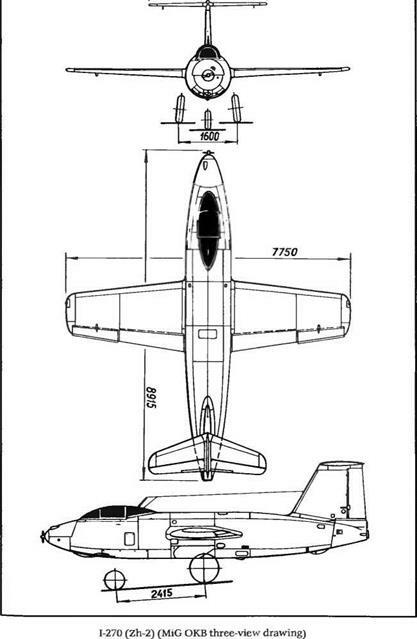 The first thing that catches one’s eye about the three-view drawing of the Zh is the T-tail (the stabilizer is on top of the fin). In a note dated 30 May 1946 that was included with the preliminary design, Mikoyan and Guryevich wrote "If one reduces the effect of the wing on the sta­bilizer, it may be supposed that the moment characteristics will not be modified up to Mach 0 9 This is why the stabilizer has been moved upward, in relation to the wing, this displacement is equal to 1 2 MAC (mean aerodynamic chord).” Similar high-set stabilizers would appear later on transonic aircraft such as the MiG-15, MiG-17, and 1-320 But in 1946 TsAGI had not yet studied the characteristics of swept-wing air­craft, and manufacturers were not yet equipped with the necessary experimental and scientific facilities. This is why both 1-270 prototypes built at the end of 1946 had a straight wing The sweep angle at the leading edge was 12 degrees. Only the stabilizer was swept back (30 degrees at the leading edge) as shown in the preliminary design. 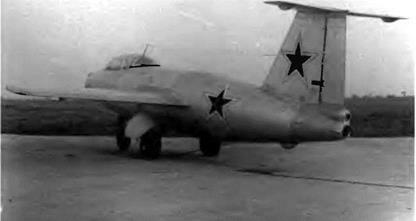 The first prototype of the 1-270, or Zh-1, made its First flight without its power plant, towed behind a Tu-2 It was then released and allowed to glide to a landing. 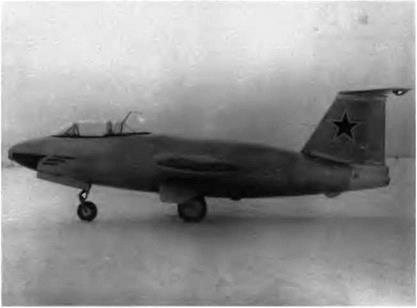 The Zh-1 was somewhat short-lived Test pilot Yuganov had to make a belly landing, and the aircraft was thought to be beyond repair. Span, 7 75 m (25 ft 5 1 in); length, 8 915 m (29 ft 3 in); height, 3 08 m (10 ft 1 3 in), height in level flight position, 2 58 m (8 ft 5 6 in), wheel track, 1.6 m (5 ft 3 in); wheel base, 2.415 m (7 ft 11 10 in), wing area, 12 m2 (129 2 sq ft), empty weight, 1,546 kg (3,407 lb); takeoff weight, 4,120 kg (9,080 lb), propellants, 2,120 kg (4,672 lb), wing loading, 343.3 kg/m2 (70 4 lb/sq ft). This photograph of the Zh-2 shows the two superimposed chambers of the RD-2M-3V rocket engine. Max speed, 900 km/h at 5,000 m (486 kt at 16,400 ft), 928 km/h at 10,000 m (501 kt at 32,800 ft), 936 km/h at 15,000 m (505 kt at 49,200 ft), climb to 10,000 m (33,800 ft) in 2.37 min; to 15,000 m (49,200 ft) in 3.03 min; service ceiling, 17,000 m (55,760 ft), landing speed 137 km/h (74 kt); takeoff roll, 895 m (2,935 ft); landing roll, 493 m (1,617 ft); endurance with both chambers, 255 sec; with the cruise chamber only, 543 sec.